While we‘re discussing personal finances: Trump’s tax dodges represent millions of dollars taken from schoolchildren, teachers, firehouses, senior centers & more. Strange that my normal, working class checking account attracts more attn than public theft. Your periodic reminder: Four months ago we learned there is extensive documentary evidence that the president of the United States and his family planned and executed a massive tax fraud scheme worth hundreds of millions of dollars. It’s mind boggling to me how much we learned about Donald Trump and his tax shenanigans through the documents we got. It really underscores the need for presidents -- Donald Trump in particular -to release their tax returns. President Trump has sold himself as a self-made billionaire but our investigation found that he received more than $400 million from his father’s empire, much of it through dubious tax schemes during the 1990s, including instances of outright fraud. 15 days ago, the New York Times published credible evidence that the President of the United States committed large-scale, illegal tax fraud. We should still be talking about that. For anyone else, it would be a presidency-defining (or destroying) scandal. This @nytimes investigation - wow. "Mr. Trump received the equivalent today of at least $413 million from his father’s real estate empire....Much of this money came to Mr. Trump because he helped his parents dodge taxes." This story just won a Pulitzer. Read it (again). Bombshell, in a nutshell: A sitting president of the United States enriched himself from what appears to be a massive fraudulent tax-dodging inheritance scheme, documented by a trove of 100k confidential financial documents. The President is a financial fraud, made none of his own money, was consistently bailed out by his dad, and conspired with his siblings (one of whom is a federal judge) to engage in (possibly criminal) tax fraud to inherit their wealth. A New York Times investigation of the Trump family’s finances is unprecedented in scope and precision, offering the first comprehensive look at the inherited fortune and tax dodges that guaranteed Donald J. Trump a gilded life. Based on 100,000 pages of mortgages, tax returns and other documents, this is a financial biography of the 45th president that is fundamentally at odds with the story Mr. Trump has sold in his books, his TV shows and his political life. I admit I couldn’t fully focus on this last week. It’s a testament to our distorted and unmoored political moment that it hasn’t brought the Trump presidency to a standstill. The real news here is that he may actually be wealthy. The White House says Trump wasn’t mocking Ford, but was just “stating the facts.” Since they suddenly love facts so much, may I recommend the NY Times piece on their boss? It’s chock full! Tax experts briefed on The New York Times’s findings said the Trumps’ conduct presented a pattern of deception and obfuscation that repeatedly prevented the IRS from taxing large transfers of wealth to Fred Trump’s children. By age 3, Mr. Trump was earning $200,000 a year in today’s dollars from his father’s empire. He was a millionaire by age 8. "in 1990, according to previously secret depositions, Mr. Trump tried to have his father’s will rewritten in a way that Fred Trump, alarmed and angered, feared could result in his empire’s being used to bail out his son’s failing businesses." Here's, perversely, the problem w investigative journalism in midst democratic backsliding: POTUS implicated in nearly half billion dollar tax fraud scheme. Scandalous revelation w likely zero institutional response. Result: deepening crisis of legitimacy. "Trump received the equivalent today of at least $413 million from his father’s real estate empire, starting when he was a toddler and continuing to this day. Much of this money came to Mr. Trump because he helped his parents dodge taxes." If you've followed Trump's hype about his own wealth, what's most ironic is the central scheme used by the Trump family to dodge taxes, per a new @nytimes investigation: Grossly undervaluing their properties. 1/n I finally read that remarkable NYT expose of how President Trump’s riches were born through a combination of decades of full-out support from his father and tax fraud. One of their fraudulent schemes particularly got under my skin. By the way, do take the time to read the entire NYT report, which is filled with astonishing detail and a real joy to read -- a remarkable combination for a financial story. very proud of my colleagues but as I read, can't help remember that cheating the government out of taxes is seen by some as virtue, not vice. This has the deepest roots imaginable in American history. Exhibit #237 of why anyone running for federal office should have to disclose their tax returns. Congress needs to pass my legislation to #EndCorruptionNow, which would force candidates (and @realDonaldTrump) to make their tax returns public. The New York Times’s findings are based on interviews with Fred Trump’s former employees and advisers and more than 100,000 pages of documents describing the inner workings and immense profitability of his empire. Nobody in this country got rich on their own – no one. Especially not someone who probably committed tax fraud & got $413M from his father & his morally bankrupt real estate empire. Are you going to talk about that at your rally tonight, @realDonaldTrump? 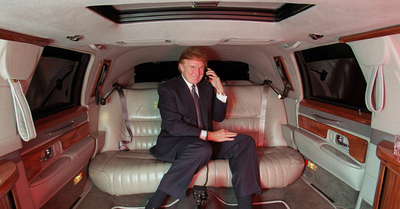 NEW...Huge NYT Investigation: President Trump participated in dubious tax schemes during the 1990s, including instances of outright fraud, that greatly increased the fortune he received from his parents. Trump participated in tax fraud schemes, according to a lengthy and detailed article from the @nytimes. This report should renew public calls for Trump to release his tax returns, as other presidential candidates have done. TRUMP said that his dad gave him "a small loan of $1M" to get him started. WRONG: Dad was giving him $200k/year in today’s dollars by age 3. After his college graduation, he was receiving the equivalent of $1M/year, which increased to $5M/year in his 40s. President Trump has long sold himself as a self-made billionaire. But a New York Times investigation found that he received at least $413 million in today’s dollars from his father’s real estate empire, much of it through tax dodges in the 1990s. Trump is a major league tax cheat, @nytimes reveals after reviewing massive trove of secret documents. Follows on my revealing he lost 2 income tax fraud trials. We lost demand Congress investigate. President Trump has long sold himself as a self-made billionaire, but a @nytimes investigation found that he received at least $413 million in today’s dollars from his father’s real estate empire, much of it through tax dodges in the 1990s. This is an insult to every American who works hard and pays their taxes. It’s long past time he be held accountable. Reminder that when Republicans learned Trump stole $400,000,000 from the American tax payer, they did not even request his tax returns. ”Is this really what we are talking about today?” Trump advisor Kellyanne Conway told CNN when asked about whether the president should release his tax returns. Answer: It is, and he should. Fred Trump’s tax returns seem to show Donald Trump engaging in suspect tax schemes and “outright fraud.” ...what would we learn from President Trump’s own tax returns? At the end of the 14,000+ word bombshell Trump tax investigation by @susannecraig @russbuettner @DavidBarstow is a familiar coda to so many major NYT deep dives: "Kitty Bennett contributed research." NYT: "President Trump participated in dubious tax schemes during the 1990s, including instances of outright fraud, that greatly increased the fortune he received from his parents, an investigation by The New York Times has found." Just finished reading the New York Times investigation of Trump's finances, beginning to end. This is one hell of a story. The reporters nailed Trump's con, the Great Lie he's been peddling all along. No wonder he won't reveal his taxes. "The president has long sold himself as a self-made billionaire, but a Times investigation found that he received at least $413M in today’s $ from his father’s real estate empire, much of it through tax dodges... including instances of *outright fraud* "
Michael Cohen told Congress today that Donald Trump would inflate his total assets when it served his purposes, and deflate them to reduce his real estate taxes. He has been doing this for decades. A look back at our October tax fraud investigation.
.@DavidBarstow @susannecraig @russbuettner deep dig into Trump money >> "President Trump participated in dubious tax schemes during the 1990s, including instances of outright fraud, that greatly increased the fortune he received from his parents"
New York Times journalists David Barstow, Susanne Craig and Russ Buettner analyzed more than 100,000 documents to understand Fred Trump’s empire and uncover income that President Donald Trump received from family enterprises. Donald Trump just criticized Sen. Bob Casey for becoming successful on the good name of his father. Seriously. Note the unambiguous language in this NYT story on the Trump finances: "Instances of outright fraud" "Overt fraud" "Appeared to be fraudulent"
I think about this story -- and how hugely important it is -- a lot. @Medusa0029 @sashiebgood @waltshaub Let’s not forget the @nytimes investigative reporting revealing Trump’s tax fraud and illegal dodges worth $413 million. Monster investigation on Trump and taxes by @DavidBarstow, @susannecraig and Russ Buettner, revealing: A sham corporation, improper deductions worth millions, possibly illegal maneuvers to skirt gift/inheritance taxes and "instances of outright fraud." So has there been any conservative pushback on this article or are we all acknowledging that Trump is a tax cheat? This is amazing, and (if I am reading right) leaves a big, juicy question unanswered: Who the heck gave the NYT all these tax documents? The New York Times should release a cost estimate for its investigation: 'Trump Engaged in Suspect Tax Schemes as He Reaped Riches From His Father.' Has to be at least $1.5 million, and probably much more. Public service journalism at its highest level. So many amazing details in the Times piece, but the best has got to be that Trump was paid a $200,000 salary by his father at age 3. This story is just a small part of a much bigger picture of an economy rigged by the wealthy and well-connected. It's time the rich pay their fair share. Feels like that NYT story on Trump family tax evasion raises some uncomfortable questions for Maryanne Trump Barry, no? More than a year in the making. Not to be missed. No wonder we haven't seen his tax returns. In-depth @nytimes investigation shows Trump used elaborate schemes, including straight-up fraud, to underpay taxes on his parents' estate. "He and his siblings set up a sham corporation to disguise millions of dollars in gifts from their parents, records and interviews show." Mr. Trump received the equivalent today of at least $413 million from his father’s real estate empire, starting when he was a toddler and continuing to this day. Much of this money came to Mr. Trump because he helped his parents dodge taxes. For the record again: The nation's leading newspaper accused the sitting president of participating in "outright fraud" in the first sentence of a document-based investigative expose. To me, the most telling detail in this stunning series of revelations comes at the end: "Had Mr. Trump done nothing but invest the money his father gave him in an index fund that tracks the Standard & Poor’s 500, he would be worth $1.96 billion today." One reason I love working at the NYT is you'll be sitting at your desk and suddenly this appears, the result of a TON of work by your colleagues. NYT investigation concludes that Trump "received the equivalent today of at least $413 million from his father’s real estate empire"
As I read the @nytimes investigation of Trump tax cheating, I think how we rig the system to benefit tycoons. Corporate tax cheating alone costs $125 billion a year, enough to pay for national pre-k, for drug treatment for all, and free community college. But remember, Hillary had emails. "But over time, as Donald Trump careened from one financial disaster to the next, his father found ways to give him substantially more money, records show." This is trenchant, revealing journalism. "Donald J. Trump accumulated wealth throughout his childhood thanks to his father, Fred C. Trump." He had an amazing father. May all of us as parents be able to give our own children the benefits of our success. Hats off. This is just an astonishing story and makes it clear Donald Trump and his siblings are a bunch of goniffs. Nervy. But goniffs. "it is unlikely that Mr. Trump would be vulnerable to criminal prosecution for helping his parents evade taxes, because the acts happened too long ago and are past the statute of limitations. There is no time limit, however, on civil fines for tax fraud"
Hiding his taxes may turn out to be the only smart thing Trump ever did. Always proud to be a ⁦@nytimes⁩ reporter. Especially proud this week as I visit Chicago & realize just how gutted @chicagotribune⁩ is. Read this piece & ask yourself what other newspaper dedicates this kind of resources to quality reporting? Has been robbing the country for decades. And set an example for his own children. Oh, yes. There was also that lengthy bombshell NYT investigation published in October showing how Trump participated in "suspect" tax schemes. The Dems are going to get those returns, folks. "Mr. Trump received the equivalent today of at least $413 million from his father’s real estate empire, starting when he was a toddler and continuing to this day." "Even more extraordinary was this unreported fact: The banks...valued Fred Trump’s empire at nearly $1 billion. In other words, Donald Trump, master dealmaker, sold his father’s empire for hundreds of millions less than it was worth." "By age 3, Mr. Trump was earning $200,000 a year in today’s dollars from his father’s empire. He was a millionaire by age 8." This is an insanely impressive feat of investigative journalism, and I have no idea how the NY Times pulled it off. Trump Engaged in Suspect Tax Schemes as He Reaped Riches From His Father nyti.ms/2P90UZD // No one from this era of NY would be surprised but insanely amazing reporting. Isn't the real conclusion though to ask why we have a tax system that incents this type of effort? 100 years ago, entrepreneurs pretended to have inherited their money. Today, inheritors pretend to have earned their money. Behind every great fortune there is a great lie. This is a Pulitzer-worthy article, a reminder of the importance of well-funded, independent investigative journalism, surely based on months or more of deep research using a mountain of original sources. It's a great piece of history. Read it. It was tax evasion that got Al Capone not his other crimes too. Mr. Trump received the equivalent today of at least $413 million from his father’s real estate empire, starting when he was a toddler and continuing to this day. For more than a year, we've wondered what @davidbarstow @susannecraig and @russbuettner were up to in that conference room with the stacks and stacks of paper. Figured it would be amazing. Now we know that it really, really is..
On the one hand, we now have strong evidence that the Trumps lied and defrauded the tax-paying public. It’s criminal. On the other, I fear the entire GOP leadership and base will say, “so what?” Accepting corruption is part of the deal. Truth be damned. The @nytimes "in reviewing >100,000 pages of records, found that Mr. #Trump ’s finances were deeply intertwined with, & dependent on, his father’s wealth. By age 3, Mr. Trump was earning $200,000/yr frm his father’s empire. He was a millionaire by age 8." So, in addition to 6 bankruptcies, screwing creditors, scamming banks, borrowing dirty money from Russian mob, skipping on his taxes, and lying every step of the way, now this scumbag didn't even make the first $400 mil on his own? Wow, what a surprise. Imagine being surprised to learn that Trump is an inveterate tax cheat, and that his story of self-creation is complete fiction. It's sad that so much investigative legwork must now be poured into confirming the painfully obvious. The @nytimes obliterates @realDonaldTrump's autobiography. Masterful: "Although Fred Trump became wealthy w/ help from federal housing subsidies, he insisted that it was manifestly unfair for the government to tax his fortune as it passed to his children." This is our president. To quote Ta-Nehisi Coates, as I'm doing a lot these days, this is the cost of whiteness. Pity that the ⁦@nytimes⁩ didn’t reveal this and other Trump cons before November 2016. No they don't. "The Times’s findings raise new questions about Mr. Trump’s refusal to release his income tax returns"
"The president has long sold himself as a self-made billionaire, but a Times investigation found that he received at least $413 million in today’s dollars from his father’s real estate empire, much of it through tax dodges in the 1990s." To answer my own question, yes it's true (as stated in the @NYTimes): "By age 3, Mr. Trump was earning $200,000 a year in today’s dollars from his father’s empire. He was a millionaire by age 8", as part of a tax-avoidance scheme. NYT says Trump is a crook. If the rule of law applied to the rich in America then Trump would be in prison rather than the White House. Investigative journalism is an essential element of a modern democratic society. Amazing reporting here. "They were both fluent in the language of half-truths & lies. They both delighted in transgressing without getting caught. They were both wizards at manipulating the value of their assets,making them appear worth a lot or a little depending on their needs"
Some people resent paying taxes because they think the President cheats on his taxes. Those people are correct. An impressive investigation, to say the very very least. And here is the astonishingly thorough Trump story by "the accounting firm of Craig, Barstow and Buettner"
This news won’t make any difference to his supporters. They’ll think it was smart of him and laugh, or they’ll discount it as “fake news” from the “failing New York Times.” Or, they’ll never hear it at all. TBH I suspect this isn't have more impact because everybody already feels like they know it, and have fully integrated it into their views of Trump. "Self-made" man's dad gave him $200,000 a year from age 3; $1 million a year after college; more than $5 million annually in his 40s and 50s. Amazing reporting, which most people will basically ignore, because they're really only interested in culture-wars stories and getting their daily fix of OUTRAGE. This is incredible reporting. I'm going to cite the number $413 million over and over again to illustrate the power of inherited (NOT earned) resources: "Trump Engaged in Suspect Tax Schemes as He Reaped Riches From His Father"
Finally got through this. Kudos to the NYT for a monumental piece of investigative journalism: "Trump Engaged in Suspect Tax Schemes as He Reaped Riches From His Father"
It’s a damning read, but not shocking to anyone who’s been paying attention. What is impressive is the work The NY Times put into this report. God's decision to spend a couple years humiliating @Chris_arnade was an interesting move. Back to an almost-forgotten story from several days ago: the President of the US became rich (and ultimately became President) mainly by cheating on taxes, to the tune of several hundred million $$$$. Kind of a big deal. Used to be in president-press relations something called a gaffe. The gaffe doesn't exist any more because it's become the whole presidency. This method is surprisingly effective. Works for fact-checking too. Now it's been extended to big investigations. Hey remember this? Trump isn't much of a businessman but he's a key member of a multigenerational tax fraud with a sideline in general con artistry and, oh, racist reality TV. I’ll say it again. Subpoena his tax returns and follow the money. Hello? .......... Hello?